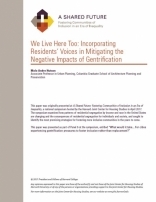 This paper focuses on strategies for ensuring key actors hear and respond to the concerns of long-term residents in gentrifying areas, reviews the key causes and consequences of gentrification, and notes that responding to its effects requires that longstanding community residents organize and make their voices heard. Moreover, governments and developers should work to include such residents in the planning of urban revitalization project from the outset. Community leaders in cities like Boston, Washington DC, and San Francisco have formed (or are forming) community coalitions focused on protecting their interests and transforming their communities into sustainable, healthy communities. Moreover, unlike some past efforts, these coalitions are not fighting to stop economic development and growth; rather, they are struggling to be a part of the new economic and social transformation taking place in their neighborhoods. Many of these initiatives make use of legally-binding Community Benefits Agreements (CBAs), which define goals for housing, employment, and other facilities and programs that will be provided by the developers of major new projects. Such approaches, he notes, require not only extensive consultation with affected communities, but also that community leaders be willing to compromise. While a willingness to compromise has become more difficult in our current hyper-polarized political and social environment, it is often necessary for a community's goals to be realized.